If you need attic renovation services, you more than likely require some professional assistance. Wouldn't you know it, our team at Air Duct Cleaning Pleasanton has become highly proficient in providing local homeowners with just that. When you have your air ducts cleaned you are improving the air quality in your home or office. 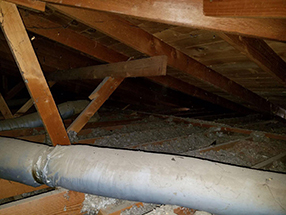 If you remove the old insulation in your attic and have it replaced, you are improving not only the attic itself, you're also ridding your home of potentially harmful allergens, pest infestations, and any accumulated mold. These types of contaminants can cause and exacerbate asthma and other respiratory problems. Our professionals have the right equipment and protective clothing necessary to do the job. 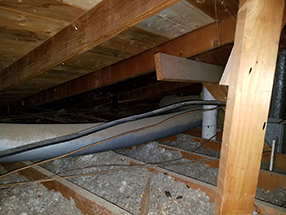 We can also make your attic rodent-proof, which will prevent these types of pesky critters from reclaiming the space after we're done. Of course, once the new insulation has been installed we clean up the attic and ensure that no debris is left behind. After all, what’s the point of getting rid of dampness, mold and wildlife if your attic is not in a pristine condition afterwards? We take great pride in our work and always guarantee our customers' satisfaction. While we are working on your attic, we can check your crawl space and clean it too. All too often rats and insects can be found lurking there. We would be happy to check and clean the area to ensure your family stays safe from rat bites and various insect infestations. At Air Duct Cleaning Pleasanton, we offer a wide variety of services dealing with every attic and air duct related issue. Call today to get the very best service provider around.